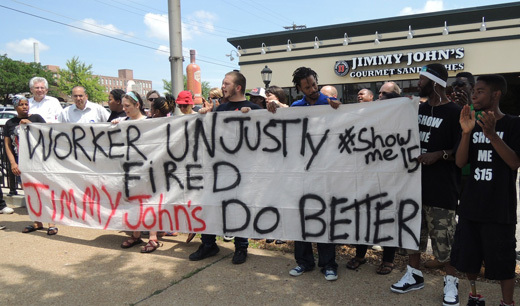 ST LOUIS — Fast food workers are rallying and marching daily outside the Jimmy John’s on S. Broadway here where Rasheen Aldridge, an organizer with Show Me $15, has been fired because of his role as a protest organizer. Show Me $15 represents workers from a variety of fast food outlets and is demanding not just a wage hike but also the right to form unions. Aldrige, who has been an outspoken leader for the cause, is slated to talk about the struggle of low-paid workers at a public forum sponsored by the People’s World at the University of Illinois at Chicago on June 13. St. Louis police have sent large numbers of squad cars to the site, parking them along the edge of the Jimmy John’s lot to keep protesters from spilling out onto the sidewalk. Earlier this week Aldridge was handed what his manager said would be his last paycheck. The St. Louis Labor Tribune reported that the manager, with a smile on his face, threatened to have Aldridge arrested if he ever set foot on Jimmy John’s property again. 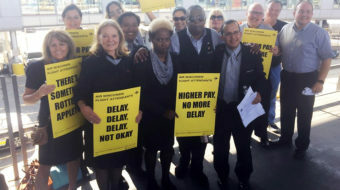 Workers have not been alone on the picket line. They are being supported by the UFCW Local 655, SEIU Healthcare and Missouri Jobs with Justice, among other groups.